now it’s time for the real fun to begin. 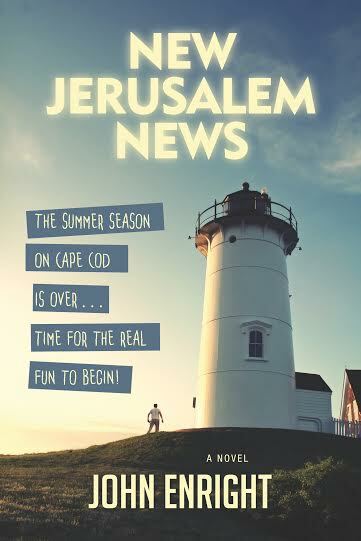 New Jerusalem News is a work of fiction set on an island in New England. Reading the synopsis is a bit misleading at the start. The plot sounds like high intrigue and fast action. Nothing could be further from the truth. But the statement that the book is all about the characters is bang on, and to focus on the characters means a slower pace to the story telling. This presents a challenge for writers. How do you keep the reader turning the page when there isn't constant action? Enright manages beautifully in this well written book. The main character - Dominick - is a professional house guest who uncharacteristically ends up spending winter months on a quiet island in the home of an elderly couple - Atticus and Lydia. While he tries his best to never get involved in the lives of those he bunks with, he finds himself slowly and increasingly entwined in their struggles - an environmental protest gone bad, health issues, a difficult daughter and more. He also finds himself in the spotlight as the main suspect at the center of a government investigation. Over the course of the story we are introduced to several other interesting locals. Each comes alive as we listen to them speak and watch them interact with other. And fun is made of bureaucracy - how single minded the focus can be and how once wrong decisions are made, the cover up begins. Truth, and history, are written as you go along. I thoroughly enjoyed this book and consumed it cover to cover. Check out my interview with author John Enright HERE! Originally from Buffalo, New York, John Enright holds a bachelor’s degree in literature from the City College of New York and a master’s degree in folklore from the University of California, Berkeley. After working in magazine journalism and book publishing, he left the U.S. to teach at the American Samoa Community College. He remained in the South Pacific for 26 years, directing environmental, cultural, and historical preservation programs and writing extensively about the islands. His acclaimed detective series, Jungle Beat (Thomas & Mercer), featuring Det. Sgt. Apelu Soifua, is set in Samoa. His collection of poems about Samoa, 14 Degrees South, won the University of the South Pacific Press’s inaugural Literature Prize for Poetry in 2011. He now lives in Jamestown, Rhode Island, with his wife, ceramicist Connie Payne.